“Lokah Laqi!” is the biggest winner at the Taipei Film Festival award giving ceremony at the Zhongshan Hall in Taipei Saturday night, capturing the titles of “Grand Prize,” “Best Director,” “Best New Talent,” “Award for Editing,” and “Best Narrative Feature.” Chen Chieh-yao (or Laha Mebow in Atayal), director of “Lokah Laqi!,” said it is the second feature length film she directed, adding that there are a great variety of topics on the country’s aborigines, which are irreplaceable. She urged the public to support creations of the aborigines because “we have great potential.” Chen graduated from the Department of Radio, TV and Film at Shih Hsin University. Trained in scriptwriting and directing, she became the first female Taiwanese aboriginal film director and TV producer, according to organizers of the Taipei Film Festival. For 18 years, she has devoted herself to film and television production with a focus on aboriginal documentary and drama, the organizers said. “Lokah Laqi!” tells the story of three Taiwanese aboriginal boys, who grew up and live in a mountain village. They are lively, mischievous and playful, yet each has something on his mind because of respective family matters. However, they have been growing up in the most “optimistic” way possible. Hunting together or selling vegetables and fruit to make pocket money has become an important pleasure in their life. 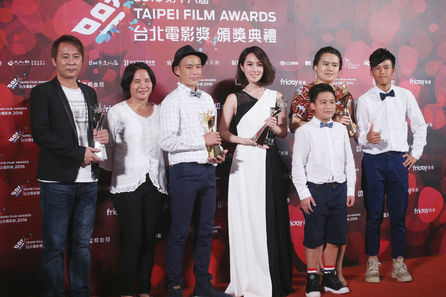 In a statement to give their reason for giving out the Best New Talent award, the jury said, “All ten actors in the movie, Buya Watan, Watan Silan, SuyanPito, Esther Huang, Tsao Shih-Huei, Mudi, Lin Jing-Lang, Sharon Kao, Uni Yeh, and Chuang Chuen-Hua, are new performers and yet they show a wonderful chemistry, a great energy, and a mutual support that is intensely moving, With such performances the film portrays an aboriginal culture and its life that is more complete and real.” Even though “Lokah Laqi!” looks like a low-cost movie, it exemplifies how such a movie can deliver sincere, powerful and above the norm performances in all respects of the profession, the jury said, adding that the way movie depicts the situations of the aborigines’ life and culture is touching and full of vitality. In the International New Talent Competition, “Don’t Look at Me That Way” directed by Uisenma Borchu won the Grand Prize. A statement of the jury said, “The jury has great pleasure in giving the Grand Prize to a stunning movie for its vitality, its audacity and its mysterious beauty.” “Keeper” directed by Guillaume Senez and “Sand Storm” directed by Elite Zexer were awarded the Special Jury Prize and the Special Mention, respectively. The Taipei Film Festival is an annual multi-cultural event containing film festival and other film culture-related activities held by the Taipei City Government and mapped out by the Department of Cultural Affairs. The festival is one of the most important and high-profile international cultural events in Taiwan, with screenings of about 160 films from over 40 different countries. With approximately 100,000 attendants each year, its majority is made up of a decidedly young audience. The festival attracts not only moviegoers but also film professionals. It has been recognized as the most influential showcase of international cinema for local film distributors in Taiwan. Last year, more than 20 films shown in the festival were sold to local distributors and had the theatrical releases in Taiwan. The festival consists of the International New Talent Competition and Taipei Film Awards Competition, with the former featuring the work of new and talented filmmakers from around the globe and the latter a competition for Taiwanese films, making this festival the best way to see works from Taiwan.